Royal Enfield - The bike that's about pride, attitude and brotherhood. The bike that's about being royal on the road. One of the oldest motorcycle manufacturers in the world, Royal Enfield has grown to be one of the fastest growing bike makers in India. Our beloved Bullet was first introduced in 1950s; and has bravely held the title of one of the oldest surviving motorcycle designs in the world. The bullet has received several makeovers in the recent years, but it retained its retro charms. Qualities like dependability, grace under pressure and companionship. Royal Enfield has secured a special place in the heart of Indians, and is set on the path of phenomenal growth. Having established a strong base in India, the bike maker now plans to target Europe, US and the Gulf. 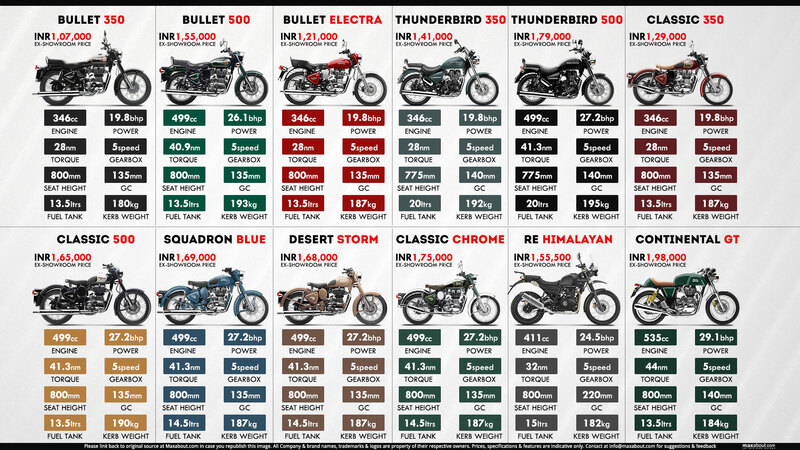 Royal Enfield's current line-up in India includes Bullet, Electra, Classic, Thunderbird, Himalayan and the Continental GT. The Bullet, Classic and Thunderbird are available in two engine variants; 350cc and 500cc. The Himalayan and Continental GT are powered by tailor made 411cc and 535cc engines. As Royal Enfield shifts towards modern technologies such as fuel injection, digital instrument cluster etc, one thing is certain, it will always remain to true to its legacy - “Made like a Gun”. Click here to know more about Royal Enfield Motorcycles.